Here are some common questions about Stepwise. Stepwise is designed to track all of your steps and provide relevant information for the current day, the past 7 day totals, and historical data. Stepwise can also measure individual trips using the Trip Counter. Visual goal progress indicator bar. Approximate Floors Climbed (iPhone 6 and newer). Press the play button to start tracking the steps taken on a specific journey. At the end of the journey, press stop to stop recording steps. Press the X button to clear the trip computer. Tap the + button next to Last 12 months to view. Swipe left and right on days or months, or tap on graph bars to open relevant month or day to view more data. Tap Share to send details of your steps from the currently displayed day via iMessage, eMail, Twitter, Facebook and more. Or save image to Photos. Great for motivation, sharing between friends and family. Select Miles or Kilometres for Display. Set Weight (for Calories and BMI). Set Height (for BMI / Manual Stride Length). Auto Stride Length is usually most accurate. However switching this off allows you to select Gender, which will manually compute your expected stride length. Reminders are daily motivational messages. 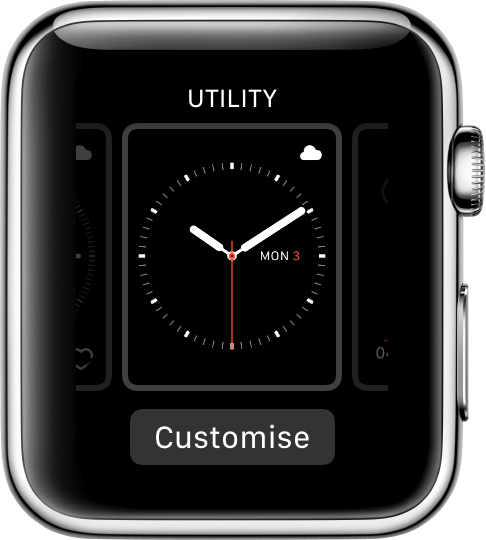 Merge Apple Watch Data will intelligently sync Apple Watch data and merge the best data from your iPhone and Apple Watch. You must install the Apple Watch app and also use a Stepwise Complication on the Watch to enable this. Export Data. Allows export of all data to a CSV file and a chart via email. (Stepwise Premium Required). Ads. Allows you to switch Ads Off or On. (Stepwise Premium Required). Help for information about Stepwise. Send Feedback. Got a question or issue? Send it to me and I will be sure to reply. Rate Stepwise. Stepwise never interrupts for ratings. Ratings really help users find the app, and the more users, the more development I can do. Email. Enter your email to receive updates about apps from Progress Concepts. Quickly view todays steps, distance and goal, calories and active time. Quickly view and manage the Trip Counter. StepWise will populate calorie data based on your activity. Stepwise will update Weight, Height and BMI in HealthKit. The Today Widget allows quick access to your current days steps, and trip counter. Tapping the widget will launch the app. To enable the Today Widget, swipe down from the top of the screen, swipe to the right, scroll to the bottom and tap Edit, tap the Green + next to StepWise, and position where you wish. 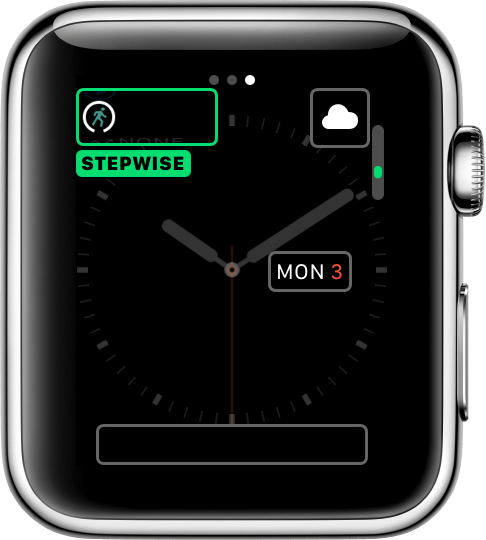 Stepwise has an Apple Watch App. 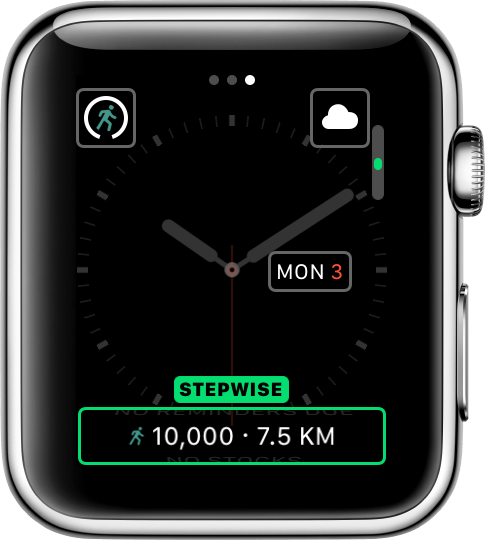 The Stepwise Apple Watch App allows you to view your step data for the current day, as well as an individual trip counter. To merge Apple Watch data with the data on your iPhone, you must install the Stepwise complication as well as the Stepwise Apple Watch app. Go to the My Watch tab and tap Complications. After you add the complication in the Apple Watch app on your iPhone, you must add it to your watch face. Go back to your watch face, firmly press the display, and tap Customize. Swipe all the way to the left to edit complications. Tap on any of the complications and turn the Digital Crown and choose Stepwise. Once you have installed the Stepwise complication, you can set Stepwise to merge your step data. Open Stepwise app on your iPhone. Go to the Me tab. Scroll to Merge Apple Watch Data and switch on. Stepwise will now intelligently merge your step data from both devices. Stepwise Premium is an optional subscription that allows you to remove ads, export your step data, and support future development. You can easily cancel at any time, from within the App or the App Store, without talking to anyone. Stepwise is designed for iPhone 5S and newer. If you are using other models Stepwise will not work. But I have an iPhone 5c: The iPhone 5c is based on the same technology as the iPhone 5. So despite being newer, it does not come with the required hardware and therefore can’t count your steps. Why are my steps not being recorded? The best place to carry your iPhone is in your trouser pocket. Please try repositioning your iPhone and retry. If steps still fail to be counted, please try the following to reboot your iPhone, as iOS itself may be failing to count the steps, and StepWise reads the information directly from iOS. Pre iPhone 7: Press and hold both the Power button and the Home button. Keep both buttons pressed whilst the screen goes blank. When the Apple logo appears, release both buttons. iPhone 7 onwards: Press and hold both the Power button and the Volume Down button. Keep both buttons pressed whilst the screen goes blank. When the Apple logo appears, release both buttons. Finally, check that StepWise can access your motion data. Go to Settings > Privacy > Motion & Fitness, and ensure Stepwise is ON. Why is my data not appearing in HealthKit? Please ensure that Stepwise is able to write to and read from HealthKit. This can be configured in Settings > Privacy > Health > Stepwise. All settings should be on. Stepwise writes calories to HealthKit the following day. Why are there already steps on first load? Your device tracks your steps in the background and stores this data for 7 days. When you open Stepwise for the first time, the app already has access to the last 7 days of data and imports it into the app. Why is my history missing? Stepwise needs to run in order to capture and process your historical data. If Stepwise is not run for a period of more than 7 days, you may experience a gap in the history data. Please run Stepwise at least once every week. Why are my steps or distance wrong? Please ensure that the iPhone is carried on your body. The best place to carry the iPhone is around your waist. It is also important that the phone is not kept in loose pockets, as this can cause the phone to record incorrect step data. For accurate step distance please ensure that “Motion Calibration and Distance” in “Settings > Privacy > Location Services > System Services is switched on and try again. Alternatively, you can use manual distance tracking. Tap the Me icon in Stepwise Turn Auto Stride Length OFF. Ensure your gender and height are set correctly. Your gender and height are used to automatically estimate your stride. If you need to increase or decrease stride length, adjust your height. It is worth noting that when walking on a treadmill, the distance travelled can be erroneous. This is usually due to the motion calibration and distance, and is caused because the device doesn’t actually move anywhere. Setting to manual as above may help, although again, when walking on a treadmill, stride length tends to differ, so results may still not be 100%. Where did the Tips go? The previous tip jar has been retired. However, the benefit of no Ads will continue for you. Tips removed ads on the current device. Tips were not restorable, so did not migrate to new devices. Stepwise Premium is a new optional subscription that allows you to remove ads, but also allows you to export your step data, and support future development. As Stepwise Premium is a subscription, it will work on new devices as it can be restored at the touch of a button. Stepwise will attempt to backup your history to iCloud (if enabled). Stepwise will also backup to the standard iPhone backups. If you migrate to a new iPhone, Stepwise will attempt to recover this data either from the backup, or from iCloud upon initial launch. If historical data is located, Stepwise will ask you if you would like to restore the previous backup. Note that if iCloud is switched off, data will not backup. Also, if iCloud is not enabled, or there is no data connectivity during first launch, the data will not be restored. 1) Force close ALL apps on your iPhone (Follow the instructions here under Force an iOS app to close here: https://www.progressconcepts.com/help/) and do it to every app on your phone. 3) Force restart the watch (Press and hold both the Digital Crown and Side Button until the screen goes blank and the Apple Logo appears, then wait 5 minutes (this allows everything time to start up). Open the Stepwise app via the app launcher (not the complication) on your watch. It is worth noting that the issue is not usually caused by Stepwise itself. The issue is usually an issue with either iOS or watchOS, that corrects itself when the hard reboots are done. Hopefully this should resolve your issue. If not, please reach out to me via the feedback option within the app.